If you know me, you know that I used to be a huge fan the East Coast hip-hop scene in the 90’s to early 00’s. In fact, my favorite hip-hop group of all time is the Wu-Tang Clan. 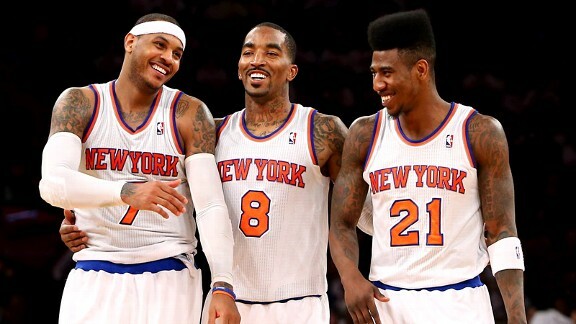 Two seasons ago, I wrote an article comparing the members of the Wu to the 9-man rotation the Thunder were using at the time. One of the things that I loved about the Wu was how they used all their aliases. For example, Rza, the musical genius and de facto leader of the group, went by a couple of aliases that related to his mood. If he felt like a partying B-boy, his alias was Bobby Digital. If he wanted to incite deep thought through his lyrics, he was known as the Rzarector through his side group, the Gravediggaz. And if he wanted to hit you with some street-inspired raps, he was known as Bobby Steels. It’s a trend that many rappers used. Eminem was probably the best known artist to use this technique. Eminem has three alter egos: Eminem (the rapper), Marshall Mathers (the tragic, real life figure from where the pain comes from), and Slim Shady (the YOLO, don’t give a (word) psycho that offends anyone and everyone while waving two middle fingers in the air). In essence, though, we all have differing alter egos. No matter how much you try to deny it, you act differently when you are around different people. The “hanging out with friends” you is different than the “having dinner with the parents” you. The “going to church” you is different than the “just had a few drinks and now I’m loose” you. Alter egos are just ways to adjust to different situation. Artists have taken that concept and turned it into an art form. And, of course, as the saying goes, “musicians want to be athletes and athletes want to be musicians”. So, it was only natural, that athletes would start to participate in this act. You could say that Daryl Dawkins started this trend when he decided to name his dunks. But the trend reached its zenith when Shaquille O’Neal decided to name himself every possible nickname available to man. The alias could be regional (The Big Shaqtus for when he played for Phoenix), heroic (Superman), or philosophical (The Big Aristotle). No matter how corny the names were, they worked for the big jovial lug. It became the norm to give yourself a nickname. Kobe Bryant, probably tired of being called just Kobe, and needing a marketing ploy, decided to coin himself Black Mamba. And though it felt forced, it actually became second nature to refer to Kobe as the Black Mamba. I miss the days when nicknames were, not only original, but earned from outsiders. Gone are the times when a guy could come into the league with the moniker “Magic”, and become a magician on the court. Or when a guy was bestowed the name Air because of his ability to seemingly transcend gravity. It got to the point where originality was lost and most nicknames became shortened versions of the player’s name (VC, TMac, AI, DWade, etc). But then, in comes this man. A man whose physical attributes warrant a nickname, but whose game warrants another nickname. A man whose style of play warrants even another nickname. Kevin Wayne Durant came into the league in 2007, and since then, people have been looking for that one name that sticks. But really, every nickname that been bestowed on Durant makes the man. 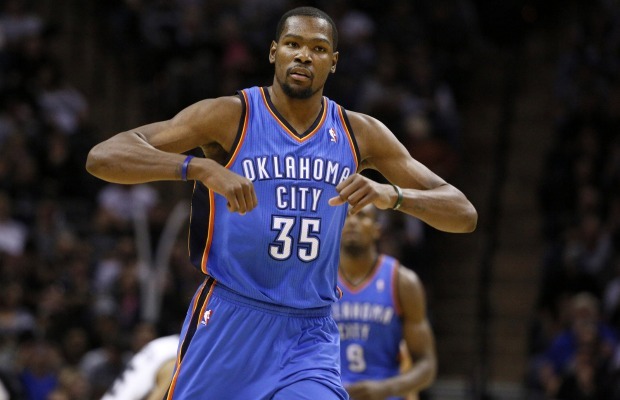 The name given to Durant since the beginning of his career because of his physical attributes. A 6’11” frame (don’t give me that 6’9″ poppycock) with a 7’4″ wingspan. Tall, lean, and rangy, but also with the fluidity to move around like a guard. When those arms go out and frame gets down into a defensive crouch, that’s over 7300 cubic inches of real estate to get around, taking into account 83 inches for height and 88 inches for length. 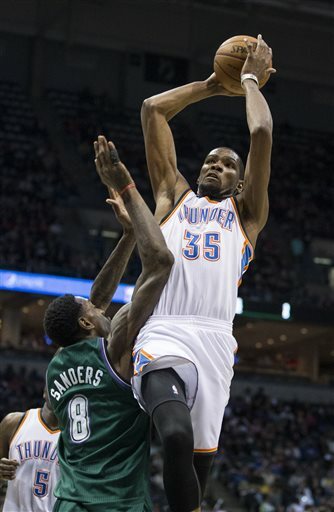 It can almost seem like Durant has got 8 arms with as much ground and air space that he can take up. But that name never really took off. I mean, it was used on shirts and print, and was semi-popular, but Durant never really endorsed it. And then some guitarist with an inferiority complex named Mark Durante decided to sue Durant, claiming that he used the nickname Durantula first. So, that basically spelled the end of it for that nickname. A Nike ad campaign for House of Hoops in 2009 gave Durant the nickname Velvet Hoop. Nothing ever really came out of it, but I have always loved that moniker. It personifies Durant’s game so well. Smooth like velvet. But unfortunately, it also makes for a stupid nickname. Too long and an inability to become personified. It just doesn’t roll off the tongue. 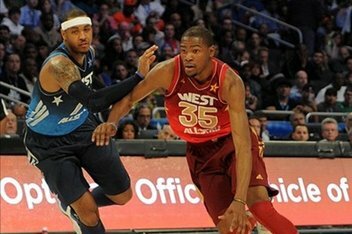 “At forward, 6’9″, from Texas, KEVIN ‘VELVET HOOP’ DURANT!! !” Yeah, on to the next one. The brand. While originality lacks when it comes to this nickname, it still works great. It’s short and rolls off the tongue. It’s not shrouded in any emotional or negative imagery. It’s just two letters. A “K” and a “D”. It works well with adult and children alike. 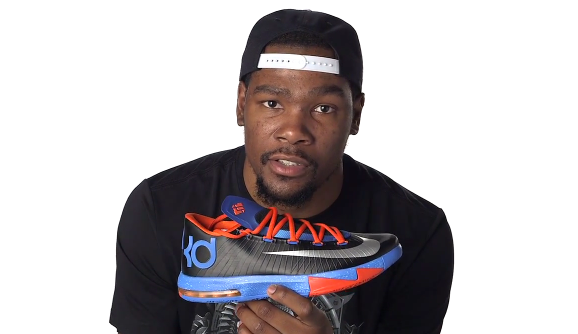 Durant is able to put his full support behind it without any fear of litigation. They are his initials and there are no copyright infringement laws when it comes to a person’s initials. This is the empire that Durant (and Nike) will continue to build off of. Think of a junkyard dog. What descriptive images come to mind? Something that is snarling and over-salivating. Something that elicits fear. Something big and strong. 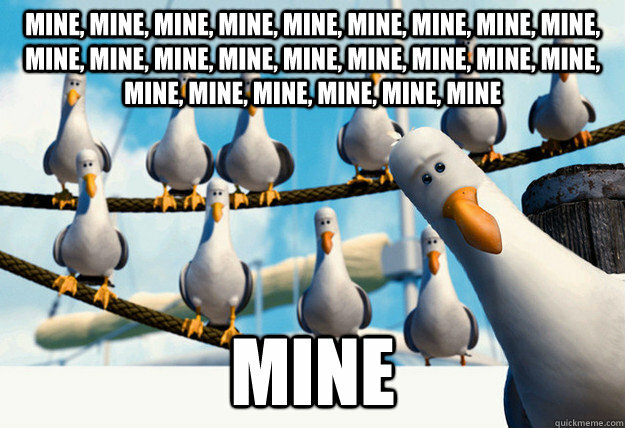 When Durant starts to take charge of a game, he is all these descriptors wrapped in one. 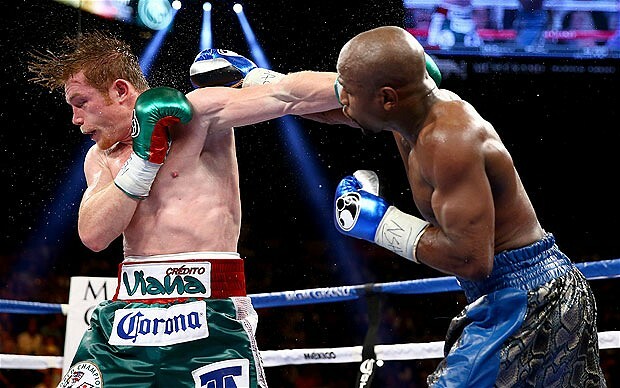 It is during these runs that he tries his hardest humiliate and emasculate the opponent. The Junkyard Dog doesn’t come out very often, but when he does, opponent are usually left trembling in fear in his wake. The Slim Reaper comes out very seldom. Always in the 4th quarter and always when the Thunder are down. But when he does show up, his antics are spoken of near and far. It usually starts when something gets Durant angry. The trigger could be as slight as a missed call, a harassing player, a technical foul, or just plain annoyance. But when the fuse is lit, the ride is just beginning. We’ve seen glimpses of the Reaper. Game 5 against the Denver Nuggets in the 2011 NBA playoffs. 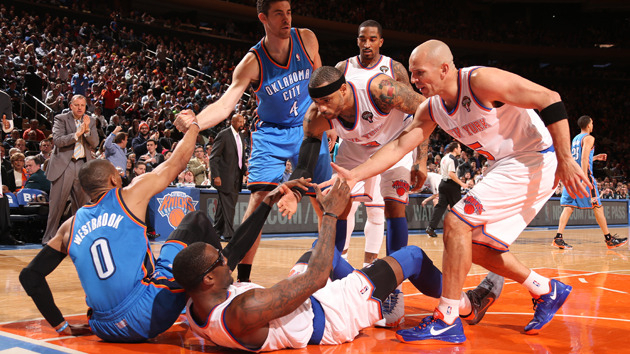 The Thunder found themselves down by 9 with four minutes left in the 4th quarter. Lose the game and you risk having a Game 6 in Denver. 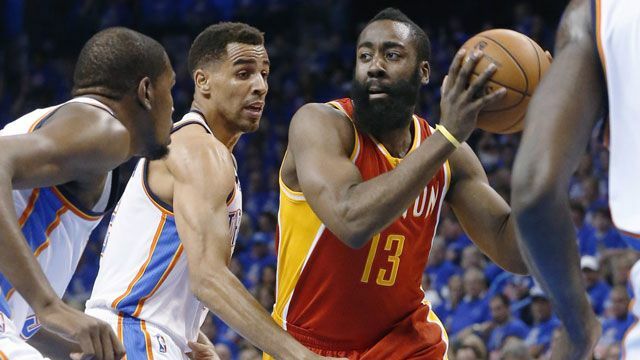 Then the Reaper showed up and outscored the Nuggets 14-6 in the final four minutes to win the game and clinch the Thunder’s first playoff series. Then the Reaper went dormant. He would show up occasionally, but it was sometimes difficult to discern between The Junkyard Dog and the Slim Reaper. It’s usually something in a game that brings the Reaper out. 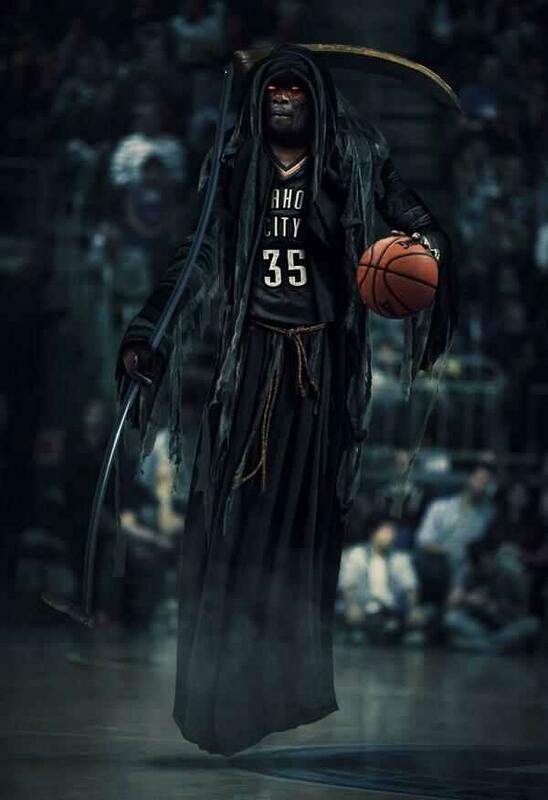 But this time, I think it was a game itself that turned Durant into the Reaper. When the Thunder faced the Memphis Grizzlies on January 14th, the team reverted back to it’s playoff mode of depending on Durant to do everything. The team fell behind in the third quarter, and could never make up that deficit. But something happened in Durant that night. Maybe he looked at the schedule and saw that 4 of the team’s next 5 opponent were against the upper echelon of the Western Conference. Maybe he finally realized how to play in the absence of Russell Westbrook. Maybe he embraced that fact that, for this team to win, he would need to shoulder the load offensively and be more aggressive. Maybe he realized that the best option on the floor 90% of the time is the guy whose jersey number is 35. Or maybe he just got hot at the right time and realized the no one, no team, and no scheme in the NBA, can guard him. The results have been terrifying for the league. Eleven straight games of 30 points or more. A triple double mixed in there. Averages of 38.7 points, 6.4 rebounds, and 6.4 assists in the last two weeks. 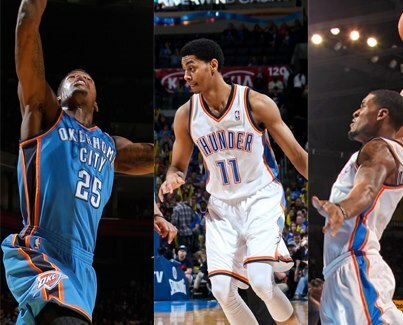 In addition, Serge Ibaka and Reggie Jackson have greatly benefited from the added attention Durant has been receiving. The Reaper is a man on a mission. 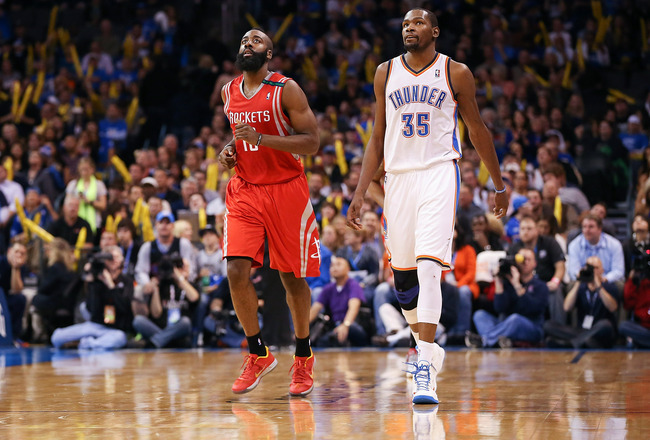 Durant said before last season’s playoffs started that he was tired of finishing second. Well, the Reaper is the devilish conscious that continuously reminds Durant that he has finished 2nd his entire career. And, to the chagrin of the NBA, I believe the Reaper is here to stay. 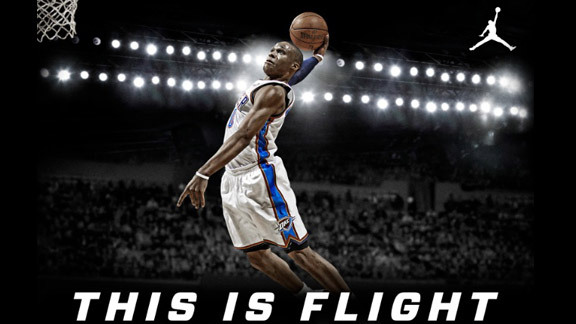 This past week, Russell Westbrook signed with Jordan Brand, after being with Nike for the first 4 years of his career. 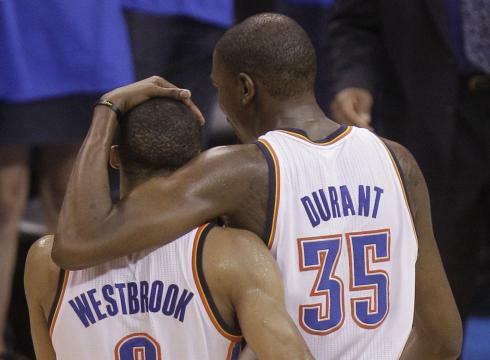 While Westbrook has carved out his own following of fans, he’s always been known as Kevin Durant’s sidekick. The Robin to Durant’s Batman. This generation’s ultimate second banana. There hasn’t been a sidekick this good since Scottie Pippen. But, Pippen never received the boost in popularity that Westbrook is about to receive. What qualifies for a sidekick? A sidekick has to be a rookie or a very young player that is brought in after the primary player is established to specifically fill the needs the team is missing. Another qualification is that the pairing has to be together for 5+ seasons. 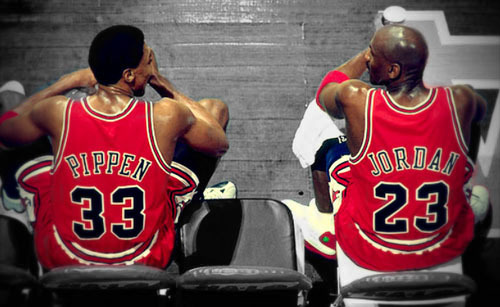 For example, Scottie Pippen was obtained by the Chicago Bulls in a draft day deal, while already having an established superstar in Michael Jordan. Russell Westbrook was drafted by the Seattle Supersonics (Oklahoma City Thunder) after they already had an established young star in Kevin Durant. Anfernee Hardaway almost made it to great sidekick status, but injuries and Shaquille O’Neal’s departure to the Los Angeles Lakers negated that possibility. The Lebron James/Dwayne Wade/Chris Bosh mash-up wouldn’t qualify as sidekicks because they were all alpha males on their respective teams before they joined forces. Kobe Bryant and the aforementioned O’Neal made a great duo, but they were brought onto the Lakers the same year and often quibbled over who was the alpha male. Not necessarily the sexiest of scouting reports for someone who would eventually become one of the top 50 players in league history. While Pippen built his legacy on defense, he was also an apt offensive player, becoming the archetype for the point forward position. During his prime (1989-1999), Pippen had per game averages of 19.1 points, 7.1 rebounds, 5.9 assists, 2.2 steals, and 0.9 blocks. Not necessarily the offensive prowess that Larry Bird possessed, but with a stat line like that, Pippen should have been heralded as his generation’s defensive Larry Bird. Instead, he was teamed up with arguably the greatest player of any generation in Michael Jordan. There usually isn’t a lot of spotlight left when you are playing with the greatest. Ask 100 people who the lead singer of Aerosmith is, and most will answer Steven Tyler. Ask them who the drummer is, and not many will know the answer. Pippen’s play on the court should have spurred him to more shoe deals, more advertisement contracts, and more widespread popularity. And yet, when his career was all said and done, you couldn’t help but wonder whether Pippen got everything that was owed to him. 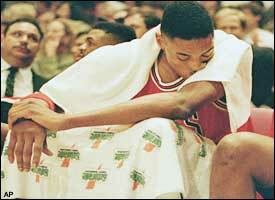 There were the stories of how Pippen felt he wasn’t getting paid what he deserved (which he wasn’t). There were the rumors that he felt slighted being outside of the limelight, when he provided so much to the team. While he did have his own shoe line (the PIPs) from Nike, they only lasted about two series. So, needless to say, not many companies bought into Scottie Pippen. It wasn’t Jordan’s fault, though. Most of the blame lies squarely on Pippen. He didn’t have the same tact with the media that Jordan did. He was dismissive and defensive at times with reporters. Then there were the crunch time situations. Those critical times in games that live in lore and become mythologized. It’s not that Pippen didn’t perform well during those times. On the contrary, he performed great during crunch time. But he’s instead remembered for the times he quit on his team in the most critical of moments. There was the time he sat out Game 7 of the 1990 Eastern Conference Finals against the Detroit Pistons with a migraine headache. The Bulls eventually lost that game. Probably the most damning, though, was the one where he sat out the final 1.8 seconds of Game 3 of the 1994 Eastern Conference Semifinals against the New York Knicks because Phil Jackson drew up a play for Toni Kukoc to take the final shot, instead of Pippen. To make matters worse, Kukoc actually hit the game winner. This one was the most damaging because it came at a time when the Bulls were his team due to Jordan’s hiatus into baseball. When you are known to quit on your team during crucial periods, your popularity takes a big hit. 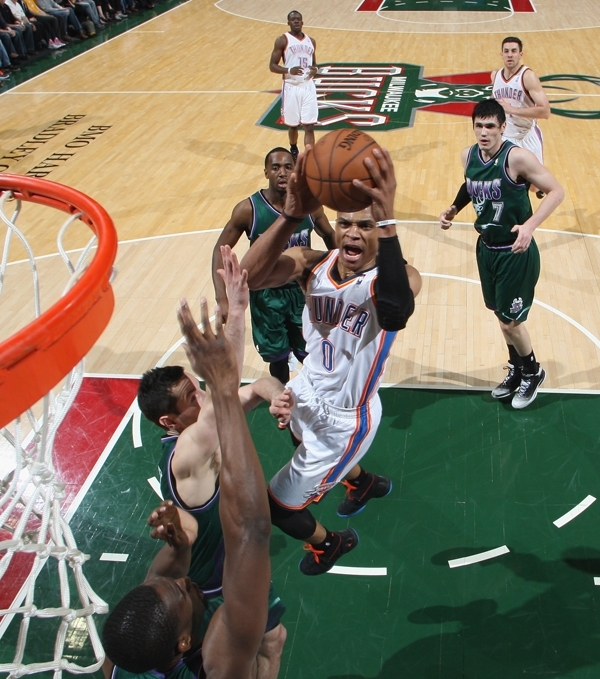 Which brings us to the best sidekick of this generation, Oklahoma City Thunder guard Russell Westbrook. Like Pippen, Westbrook was not highly decorated coming out of college. Like Pippen, Westbrook was drafted by a team that already had a young star in Kevin Durant. Like Pippen, Westbrook is seen as not being very media friendly. Coincidentally, Durant, much like Jordan, is viewed as a media favorite. And, while not by his own doing, Russell was also involved in a critical game snafu, when Thunder coach Scott Brooks sat an ineffective Westbrook for the entire 4th quarter of Game 2 of the 2011 Western Conferences Finals. But, not everything is negative when it comes to Pippen and Westbrook. Both of these players are insanely loyal to their teams and teammates. Pippen had a couple opportunities to seek greener pastures during the championship run, but decided to sign for less to stay with the Bulls. 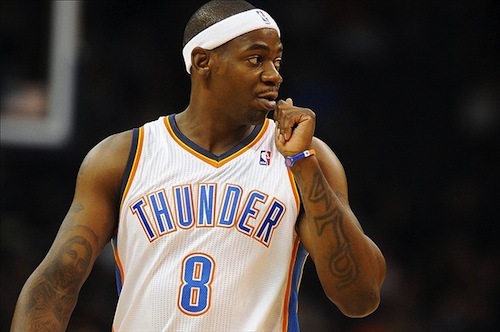 Westbrook could have done the same last season, but decided to sign for the allowable max. Both players are highly competitive, with possible chips on their shoulders from being labeled second bananas. Both players are very team oriented, as evidenced by them sacrificing a little of their own games to coexist with two great players. The good severely outweighs the bad when it comes to Westbrook and Pippen, but the bad usually has more advertising power. Which is why I found the signing of Westbrook to Jordan brand to be a bit ironic. Not ironic in the sense that he doesn’t deserve it. But ironic in the sense that a move like this will probably propel Westbrook into superstar territory, as far as media exposure goes. Into a territory that Scottie Pippen unfortunately never reached. With an endorsement team that includes Carmelo Anthony, Derek Jeter, Chris Paul, and Michael Jordan, himself, Russell Westbrook will have plenty of opportunity to expand his brand. He already has a slogan in place (WhyNot? 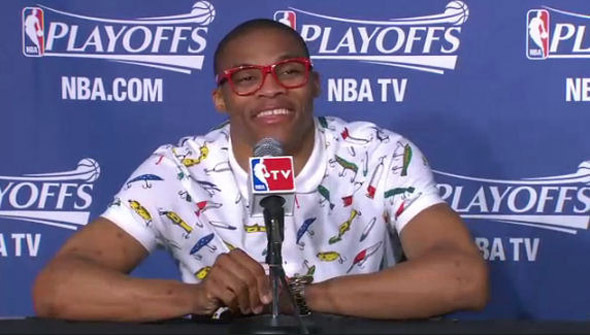 ), and already has a following outside of basketball because of his unique fashion sense. In a way, Jordan is helping this generation’s top sidekick become what his sidekick should have become. There’s a saying that goes musicians and actors want to be athletes, and athletes want to be musicians and actors. Call it what you may; a mutual respect for each others’ crafts or the need to test one’s self. But when that person ventures into the other crafts, the results are usually forgettable and regrettable. We see how entertainers perform in celebrity basketball games. The basketball players in those games, almost always retired players, have to play at 50% just to make the game even a little bit enjoyable. Basketball players are born to play basketball. While some try other ventures, they rarely achieve the success known to them on the basketball court. 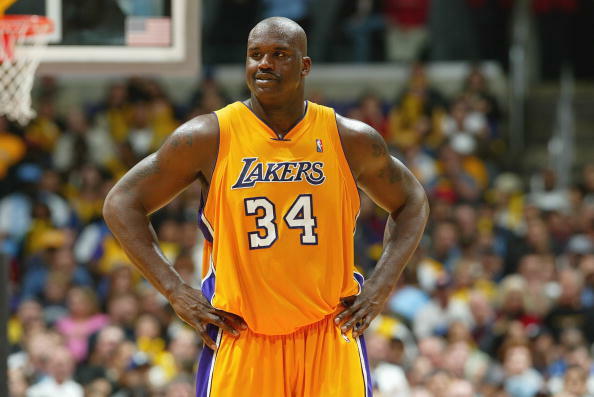 When it comes to music, many ball players have tried, but only two have had any form of success: Wayman Tisdale, who went on to become a world renowned bass player, and Shaquille O’Neal, who, regardless of what you think of his skills as a rapper, released 4 studio albums, with one going gold, and another going platinum. When it comes to basketball players and acting, the list of successes is even smaller. The greatest role for an athlete is as an athlete, especially if they are playing themselves. If you take them outside of that element, the results are extremely varied with a very high “hit or miss” potential. Kareem Abdul-Jabbar did a great job as co-pilot Roger Murdock on Airplane. John Salley did a good job in his small role as Fletcher, the computer hacker, on the two Bad Boys films. Outside of those two roles, I can’t really think of a successful acting venture for a basketball player that does not involve dribbling a basketball. Now, if the role involves playing a little basketball, then the athlete can go ahead and ease into his comfort zone. Shaq’s best acting role was as Neon Boudeaux, the “out-of-nowhere” star recruit in the movie ‘Blue Chips’. Honestly, though, that’s not really saying much when compared to such classics as ‘Kazaam’ and ‘Steel’, but you get the picture. When an athlete is able to do the thing that comes naturally to them, it makes the unnatural thing (acting) come that much easier. 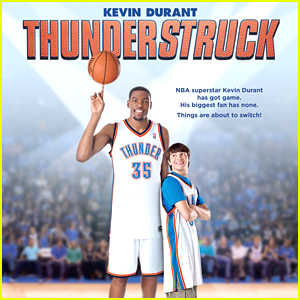 So when I heard that Kevin Durant was starring in his own movie, I was a little worried to say the least. He wasn’t a big personality like Shaq was in his heyday, and his advertisement portfolio, while growing, wasn’t necessarily anything that would indicate we had a burgeoning thespian on our hands. Also, when I heard the synopsis of the film, basically ‘Like Mike, part 8,’ I was a bit concerned that the cheesiness factor would be too much. With all that said, I thought this would be a good RedBox rental in a couple of months. Then, out of the (Thunder) blue, my ticket rep called me asking if I wanted to attend the red carpet premiere of KD’s movie. Like any good Hollywood socialite, I told him I would have to check my schedule. Two seconds later, I told him I would go, and I would be bringing 5 guests with me (my entourage). So, when the day came, we all got suited up and made our way to the premiere. We got there about an hour and a half early and watched as they vacuumed the red carpet. I vacuum my carpet all the time, but this was a RED carpet. Awesome, to say the least. We finally got our tickets and walked into the theatre, on the newly vacuumed red carpet. After getting our popcorn and drinks, we waited for the VIP’s to arrive. First through the red carpet was the always lovable Rumble, in a tux only a bison could wear. He, of course, had two Thunder girls draped on his arms. When I die, I want to come back as a hooved mascot. They get all the perks. Next up, it was the always exquisite Wanda Pratt, who rocked her aquamarine dress to a tee. “You go girl!” was all I could think in my mind. Mama Durant basically became part of the family as she bear hugged my sister twice on her walk down the red carpet. At that very moment, I turned around and legendary Oklahoma Sooners coach Barry Switzer was behind me about to walk into the theatre. Co-star Taylor Gray was the next one through the red carpet. I didn’t really know who he was, but all the pre-teen girls knew who he was. So, I figured he was somebody in the film. Then, the love child of Marty McFly and Breckin Meyer walked through the red carpet. Its always good to see Coach Scott Brooks in his offseason’s best, hair and beard both grown out. Finally, the star of the film came through. Kevin Durant looked dashing as ever in his brownish checkered vest and black undershirt, completely owning the red carpet. After a small introduction by the director of the film, it was finally time to see some movie magic. Without giving too much away in this review, I initially went into the film wondering how many cringe-worthy, cheesy moments there would be in the film. Brian (Taylor Gray) is a high school student who has aspirations of playing basketball, but is only good enough to be the water boy on the team. A huge fan of the Oklahoma City Thunder, Brian gets a chance to shoot a half court shot at halftime of a game. His shot falls way short, hitting Rumble on the head, and he ends up in the tunnel with Kevin Durant, who sympathizes with the kid and signs a ball for him. As he is handing the ball to Brian, his basketball skills are transferred to Brian in a weird cosmic mix up. The teenager ends up joining the basketball team and becoming its star, while Durant struggles with having the skills of a water boy. Through his struggles, Durant’s agent, Alan (Brandon T. Jackson), keeps looking for reasons and solutions to Durant’s dismal slump. He finally sees a mirror of Durant’s talent in this scrawny little high school kid and realizes that Durant’s talent must have been stolen. Alan approaches Brian and levels with him about his new found talent. Brian soon realizes that Alan is right and must decide whether he wants to continue with his new found fame or do the right thing and find a way to return Durant’s talents back. Are there some corny moments in his film? Of course. But, to my surprise, there weren’t any cringe-worthy, “I’m too old for this crap” moments. The surprising comedic performances of Jim Belushi, as the coach of the high school team, and Doc Shaw, as Brian’s best friend, provide enough comedy to keep you laughing out loud from time to time. Taylor Gray actually carries the movie pretty well as the lead actor, and Kevin Durant does a good job as Kevin Durant. John Whitesell, the director, does a good job of showing off Durant’s strength (basketball ability), while not trying to overdo his still burgeoning acting ability. For what I was expecting, this movie turned out to be a pleasant surprise. It had a good flow to it and didn’t lull you in the middle of the movie. My kids, 7 and 5 years old, loved it, and it held their interest throughout the entire movie. A solid ‘B’ in my book and a highly recommendable family movie.